There are now four weeks to go till the Brighton Half. From this moment forward, apart from a small sherry when Mrs R and I watch University Challenge tomorrow, no alcoholic drink will pass my lips until I cross the line on Sunday 25th February. I hope wine merchants and port shippers survive the drastic fall in trade; it’s only for four weeks. This is a significant point; I now have twelve weeks of training behind me; I'll do one more long run, perhaps ten miles or so next weekend, then a shorter one the following Sunday, and there's a cross-country event the week before. A Striders run on Wednesday, My group has done interval sessions for the past few weeks, and one of us had knee twinges, so we went for a steady run. I promised them four miles, which somehow turned into five. Nevertheless, they remained cheerful and speedy. And finally, today, twelve miles, Seaford to Newhaven and back.After last week's mud bath, I thought that I needed to run on road, the surface of the Brighton Half. I set off in good form, and fairly fast. The wind struck cold when I arrived at the sea-front, and I was glad of the running fleece I wore on top of a long-sleeved shirt. I followed the promenade to the sailing club, then took the cycle path to Newhaven. After crossing the bridge, I headed inland, down a twitten and past the boatyards, to run a circuit of the Riverside Park by the side of the Ouse. The return journey was hard, and degenerated into a savage plod. I had to add in a loop up Seaford Head to make up the distance to 12 miles, the furthest I’ll run in training. I was hungry and thirsty, and tore into some leftover roast lamb and gravy, washed down with an Adnams Ghost Ship. Last night it was the Seaford Striders' awards evening. I was pleased to see awards go to many who’d done the Couch to 5k, and astonished to receive an award for endeavour; but that was nothing to my surprise when I was also asked to present an award named after me, a 5k award, which I was delighted to present to Sandra Standen, who took herself, with outstanding determination, from couch to regular appearances at Peacehaven parkrun. Well done, Sandra. After a Wednesday night with the Striders, when I once again fed the insatiable appetite of my group for interval training, and a Peacehaven parkrun, the most significant run of the week was today’s, a ten miler to Bo Peep and back. Conditions were poor; for the first two or three miles, sheltered from the south-easterly, and in fine drizzle, I thought to myself that this is not too bad. But when I ran onto the more exposed sections of the route, I was exposed to the wind, and alternating sleet and heavier rain. In spite of a waterproof top, I was soaked through by about mile 4. There was mud too; a dog-walker I passed at Fiveways warned me that it was like an ice-rink. And indeed it was, in sections. After that dog walker, I didn’t see a soul till, past Bo Peep, heading up an extra hill to get to the five mile point, when I surprised another dog-walker. Paradoxically, though I was slow on the way out, on the return trip I seemed to find form, and managed a decent pace. Visibility came and went, sometimes I could only see a few yards in front of me, then the rain would clear a little, and I could make out Windover Hill, or Seaford Head, or other features. I arrived home soaked and frozen. Fortunately Mrs R, home with the flu, had the heating and hot water on. I made myself a dish of pasta and some leftover Abruzzi lamb sauce (it has chillies in it) and felt better. It was not a bad week, all things considered. I recorded a respectable 18 miles, led a hard intervals session with the Seaford Striders on Wednesday, ran a solitary dark evening run round Seaford on Friday, and then on Sunday completed a double of a Twitten run and the January East Sussex Cross Country League race, starting beside Lewes prison and heading up to the top of Blackcap. And sponsorship money for the Brighton Half, to support the BSUH charity, is starting to roll in. Left to right: I clutch a lamppost for support halfway round the Twitten run (photo David Stacey); approaching the Blackcap 5 turning point (photo Duncan Rawson), on the home stretch (photo Rob Read). Why the leg of my shorts should be coquettishly hitched up, I cannot say. The Twitten run was a duet between me and David Stacey, who had already run it once that morning, at 8 a.m, a special early run to accommodate those marshalling the cross country. Then, after a swift espresso, I jogged up to the car park, changed into my trail shoes, and shed a layer. Though it had been cold first thing, the Twitten run and the sun had warmed me up. We assembled by the side of the prison, where the first ever Moyleman started, before it moved to Landport Bottom. Off we went, sent on a short downhill stretch to spread us out a little before the field came to a narrow section. I had, as the organisers had requested, been realistic, so was well to the back of the pack. Then we ran up to Jill’s Pond and beyond, climbing steadily nearly all the way. At the turning point stood Duncan Rawson, this year’s Moyleman Race Director, and a Lewes AC flag. I was reminded of the 'youth who bore, 'mid snow and ice, A banner with the strange device, Excelsior!’ We exchanged genialities, and then I headed up to the highest point, and then down to where Rob Read, also of the Moyleman collective, also marshalled. Much of this route was the same as the Lewes Downland Ten, until about a mile before the end, when we turned back towards Jill’s Pond and the finish. It was hard work and, curiously, at around three and a half miles, I was seized by raging hunger. It had been a long time since breakfast. I knew I must be the last, or at best penultimate runner, and then Duncan passed me, with an easy lope, though he was carrying the flag and a rucsac. In the event I was the last of 291 runners, but several of my Seaford Strider comrades had stayed to cheer me in. A beautiful race, on a bright morning, the hills touched with mist here and there. Slow progress, but progress nevertheless. In the first week of 2018 I ran the Seaford Striders New Year’s Day run, about 5k on the seafront, some short runs to and from a gym in Brighton where I went for a personal training session and the same evening a Seaford Striders run, taking my group through a fartlek. After this I had a small man-flu relapse, with no more running until Sunday. A planned parkrun on Saturday had to be foregone. The personal training session does not mark a return to gyms, which I used in the late 90s, to no noticeable effect. I had put in a bid in a silent auction in aid of the hospital’s Zambian charity where I work, and came out as the winning bid. The trainer, Karen, was excellent, but put me through a demanding routine. Some of the acts she made me do felt downright unnatural, but she explained that she chose them to build balance and strength, qualities I lack. I shall do some of these at home: reverse lunges, and variations thereon, standing on one leg, squats and so on, but not for a whole hour. I was destroyed at the end. And so ended the ninth week of half marathon training, and the tenth week is already under way. 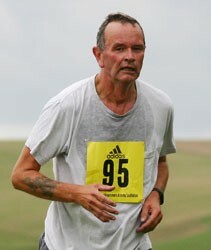 I’m back from the Seaford Striders New Year’s Day run, in one piece, although I hadn't run for ten days. It’s time to sum up 2017 and look forward to 2018. In 2017 I ran 559 miles. For comparison, in 2016 I ran 690, in 2015 582, in 2014 395 and 406 in 2013. My best ever recent year was 2005, when I ran 966 miles. As for elevation, I climbed 9,901 metres. My best ever year was, again, 2005, when I climbed 19,066 metres. So it was a modest year. The year was notable for the 2017 Moyleman, for which I served as Chief Marshal, two successful Couch to 5k events, which I helped lead with Seaford Striders, and, towards the end of this year, the formation of the Libraruns group on Strava, for running librarians. parkruns (not races, I know): 11 at Bevendean Down, 11 at Peacehaven, 1 at Eastbourne, 1 at Wimpole Estate, 1 at Preston Park and 1 at Blandford Forum. I passed my parkrun half-century. I deliberately laid off the Sussex Grand Prix races, which I had run most of in 2016, and set myself the target of a long (10 miles or more) race each quarter, which I achieved, though the long race I ran was not always the one I had intended to run. 15 mile and the Beachy Head Marathon (my first marathon for five years, and my first Beachy Head for ten). I look forward to more miles and wish all runners a happy and speedy new year.